@fabix68 should work just fine. Whats your issue? Any serial output? CR2032 and other lithium cells with the same chemistry have a strong internal resistance. It means the more current you draw from them, the more energy you will waste because of this internal resistance. It makes the voltage drop and it means your battery booster will need more and more current to maintain the output voltage = vicious circle with more and more energy wasted. 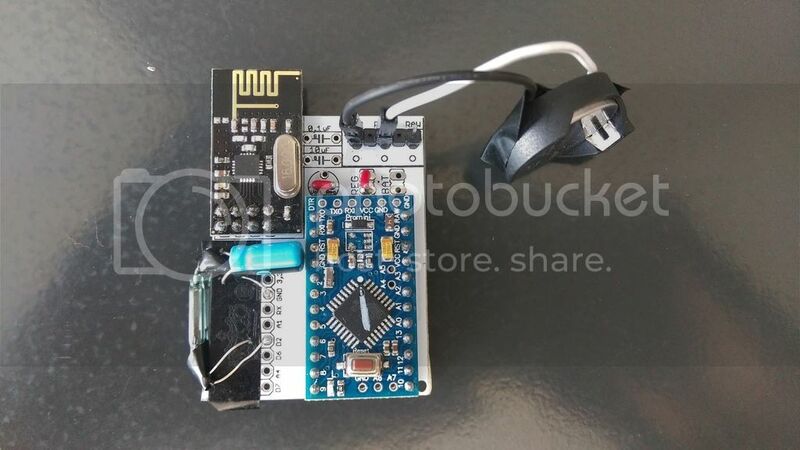 Your solution is not to add a battery booster but to use another sensor that will be able to run at low voltage: BMP180/BMP280/BME280 or SHT21/SI7021. 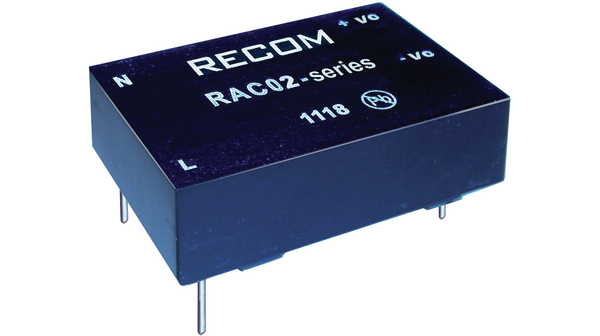 They have a very low power consumption (unlike ds18) and will accept Vcc voltage below 2V. I would suggest the SHT21/SI7021 as it's easier to use and will go in sleep mode between measurements without any action from you. Without battery booster you will also have a much increased range as the booster generates a lot of noise that perturbates the radio. adapt your sketch to sleep (with 200ms you should be ok) between all consecutive radio calls. Don't forget to do it in the presentation method as it's the most sensible part, before it's called the library has already done many radio calls that made your battery voltage drop. You should begin the presentation method with a sleep. use a brand name cell, the cheap chinese no-name cells will have much lower real capacity available, voltage will drop much faster. Nca78 thanks for the reply. I did not know the SHT21 sensor, it looks like a good alternative also DHT22. I've already added a capacitor and view the trace output with the oscilloscope, it is clean, why not explain the decrease in range. With regard to the program, has been provided for the sending of data every 5 minutes, if it changes from the previous value, to then return to sleep. I never tried to change the fuse on the PRO. I believe that this is the solution. Run it at minimum frequency, remove the BDO so you can also remove the battery booster. I am wondering on the Rev 8 boards how much room there is around the outer mounting holes to drill them a bit larger? 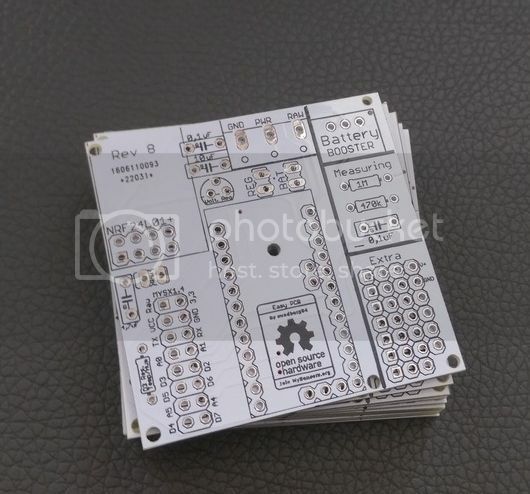 Is this just a dual layer board or are there other sandwiched layers in it that might be affected if I drill them larger?I have been trying to find a decent way to mount these and stack them with other boards, but I'm not having much luck. The project I am working on right now is a revised board for my garage door controller and I have my power supply circuit on a piece of proto board and I want to stack the newbie PCB on top of it, but can't find standoffs that small, and I am having real trouble even finding screws that will fit the holes. Has anyone done mounting of these? If I can find screws and mounting hardware that will work without having to drill the holes bigger I am all for it. I am wondering on the Rev 8 boards how much room there is around the outer mounting holes to drill them a bit larger? 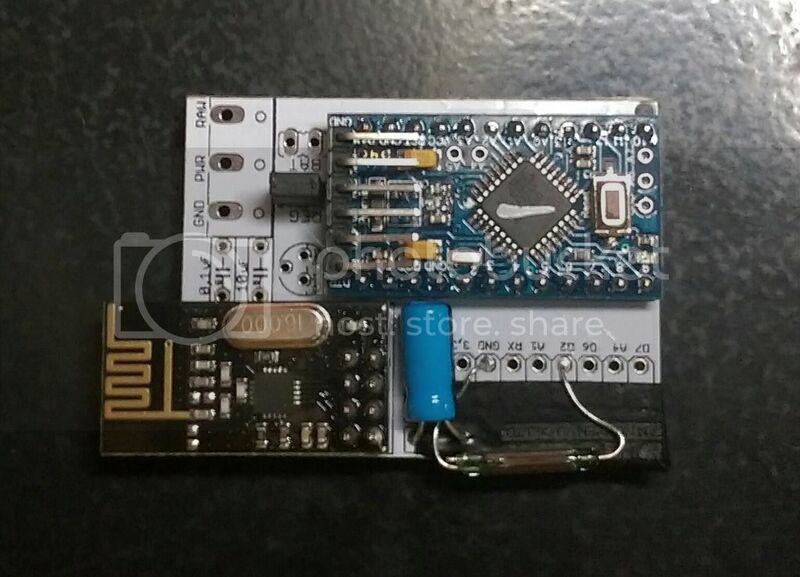 Is this just a dual layer board or are there other sandwiched layers. Its a dual board - drill as much as you want, you can see all traces. In my upcoming rev the holes are bigger. I have recieved this feedback and are improving this. In my upcoming rev the holes are bigger. I have recieved this feedback and are improving this. what should be on the next rev ? Release and if there will be more things added I dont know.